The 2016 Atlantic League Pitcher of the Year is heading to Las Vegas. 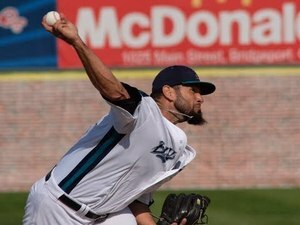 Jonathan Albaladejo signed a minor league deal with the New York Mets early last week and was promptly sent to their Triple-A Affiliate. This isn’t anything new for the 17-year professional. He’s pitched at every level from the foreign leagues, to the Independent leagues and of course, all the way to the majors. But for Albaladejo, this is nothing short of a true redemption story. His career started off as good as you could possibly ask for. Eventually released by the Pittsburgh Pirates in 2007 after spending six years in their organization, he was signed by the Washington Nationals and raised eyebrows almost immediately. When he made his MLB debut in that same season, his 1.88 ERA, 12 strikeouts, and .628 WHIP were stuff that dreams are made of. Unfortunately the Baseball Gods had other plans. The rest is history. Everyone has a plan. We never know what it will be, where will we go, and have zero clue about all the people we will encounter which is why Albaladejo’s journey is that much more fascinating. He’s been to the top of the mountain, but also had to work his way back up to the top when so many others would’ve just given up. This mentality couldn’t be any more evident than after hearing what Bluefish General Manager Paul Herrmann said about him and the confidence others feel when he’s on the mound. Over the past two seasons Albaladejo has put together 22 wins against 12 losses. His ERA is still a little ballooned at 4.20, but over the course of 44 starts, he’s been about as reliable as they come. With 8.8 SO/9 (a career high) against 2.0 BB/9 (a career low), there’s little wonder why the Mets are taking are taking advantage of this opportunity. Since inking the deal with the Mets, he’s been as advertised. In two games, and in just over 11 innings, he’s 1-0 (0.00 ERA) with 11 strikeouts.. So far so good if you ask me!